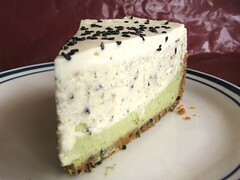 Layered Green Tea and Black Sesame Cheesecake - Do You Know The Muffin Man? Notes: I think the article is syndicated, as there are many abridged versions of the original column floating on the Web but the source article is no longer freely available. (Update: Article is back online and linked now.) For maximum flavour, I toasted the black sesame seeds in a skillet until they were fragrant. Since they're so dark, it's hard to know when to stop, but make sure you don't burn them. Part of the seeds are supposed to be ground, so I used a suribachi to do that. Matcha isn't really my cup of tea (ha ha) as I find the taste to be unpleasantly grassy but it did make a nice contrasting layer. All the tasters found it to be very delicious (but then, cheesecake rarely disappoints) and the flavours to be quite interesting. The black sesame taste was subtle, but the occasional crunch of a whole seed in the crust or filling reinforces the flavour. 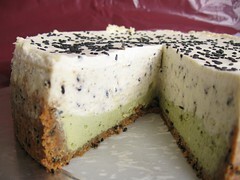 The green tea layer was a little strong for me, but any less matcha would have resulted in a paler colour. This is the first time I made a sour cream topping for cheesecake: its tanginess is not bad, but adds unnecessary calories in my opinion.